We take great pride in devising our menu, sourcing the best possible ingredients and putting our heart & soul into their preparation and cooking... We welcome, thrive and depend on constructive feedback so if you have an opinion on our food please do not hesitate to contact us! 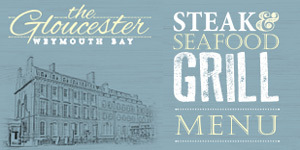 If you would like to view or download a PDF version of our menu please click here. The Black Rock Grill is a unique, delicious, healthy interactive dining experience that allows your meal to be presented cooking on the volcanic rocks at your table. Please ensure that poultry is cooked right the way through. We want you to enjoy your meal so PLEASE DO NOT TOUCH THE ROCK, IT'S EXTREMELY HOT! If you need any further assistance please don't hesitate to ask a member of staff. All Black Rock Grills are served with chips or jacket potato and a fresh mixed salad.